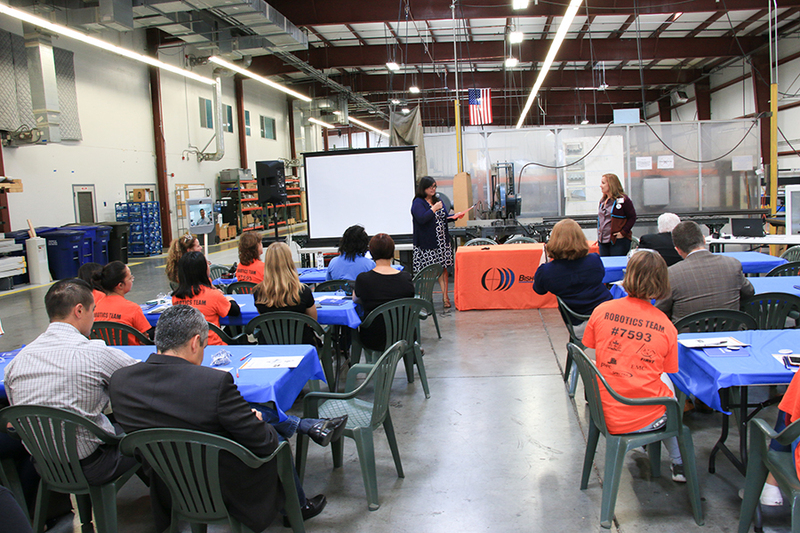 Q: How does Manufacturing Day fit with the mission/goals of the CCEP and EBLC? MO: The Contra Costa Economic Partnership (CCEP) is focused on supporting policy research that helps both public and private sector leaders gain a better understanding about how to promote economic development. The CCEP’s sister organization, the East Bay Leadership Council (EBLC), advocates for policies that promote economic vitality and quality of life. The idea is that CCEP helps inform the EBLC’s advocacy agenda while EBLC helps inform CCEP’s advocacy agenda. CCEP’s research agenda includes the STEM Workplace Initiative which involves organizing a science and engineering fair, as well as summer camp programs for students and teachers. More generally, this initiative seeks to better align education at every level with the needs of the region’s employers. This work expands career opportunities for locals while facilitating economic growth for companies—it’s a win-win. Q: What role does Bishop-Wisecarver have in the CCEP/EBLC? MO: The CCEP and EBLC are very involved in the East Bay Advanced Manufacturing Partnership and we are lucky to have the leadership of Bishop-Wisecarver in that important work including hosting days like Manufacturing Day. Q: How are events like this beneficial to local schools and students? MO: We can tell students over and over again that they should pursue a career in manufacturing. We can emphasize that the jobs pay well and provide diverse career opportunities. But for them to really get it, they need to see it for themselves. That’s why days like Manufacturing Day at Bishop-Wisecarver are so important. Q: How is the manufacturing industry important to the East Bay community and what do you see for its economic future? MO: Manufacturing is part of the East Bay’s history, but it’s not the industry’s past that is so important to the region. Manufacturing is critical to the strength of today’s economy. Manufacturing amplifies supporting industries and creates even more jobs. For every $1 spent in manufacturing, $1.4 dollars is added to the economy. That magnitude of that multiplier effect is made apparent when you realize that one third of all jobs in the Bay Area are with businesses who either make or move goods. Q: As you attended the event, what did you see, hear or notice that made an impact on you or those around you? MO: The attention to evolving aspects of the industry, including 3D printing, left the impression that Bishop-Wisecarver is committed to thriving long into the future by understanding emerging trends and innovations even when they disrupt the status quo. Q: Any closing thoughts or comments from the day? MO: It was clear to me that your team is genuinely passionate about their work and enjoyed the opportunity to connect with local students. The future of East Bay manufacturing is bright because of companies like Bishop-Wisecarver. The Bishop-Wisecarver Group is proud to be affiliated with the regional and national organizations that help strengthen the manufacturing industry. Plans for Manufacturing Day 2017 are already underway as BWG continues its commitment to educate students and parents about the incredible career opportunities in this industry.